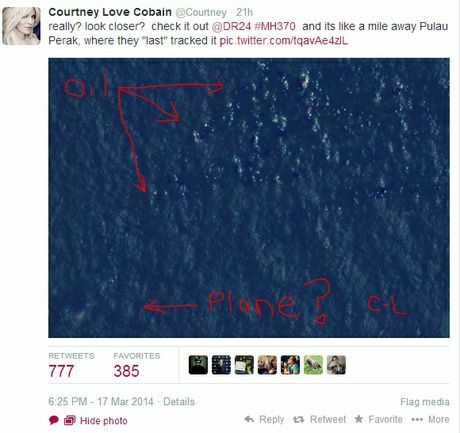 FORMER Hole singer Courtney Love has joined in the search for the missing Air Malaysia flight MH370. In fact, yesterday the widow of Nirvana front-man Kurt Cobain took to Twitter to post an image of what she believes is wreckage from the plane and an oil slick. "I'm no expert but up close this does look like a plane and an oil slick," Love tweeted. She then went on to tweet: "really? look closer? check it out @DR24 #MH370 and its like a mile away Pulau Perak, where they "last" tracked it "
Despite the assistance of Love the aircraft which was carrying 239 passengers when it departed from Kualar Lumpur on Saturday, March 8, is still missing.